I'm writing this on Thursday and the last few days are kind of a blur. As we head north back to Fort Lauderdale, Cuba is off our starboard side, the sun glistening off the azure blue water with the tropical air is mesmerizing. We will miss it when we get home tomorrow afternoon. A few highlights. Our neighbours John and Pat in room 1626 have become good friends. 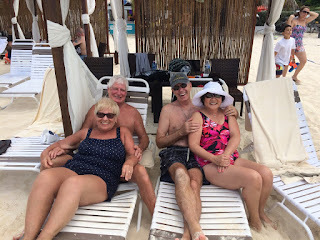 For our one day stay in Grand Cayman John had pre-booked a cabana for four at The Royal Palm on Seven Mile Beach and they graciously asked us to join them. What a wonderful treat this was. The Royal Palm has cruisers beach needs all figured out. After disembarking Equinox on tenders (along with four cruise ships) we got a ride in a mid sized van to the Royal Palm. John flashed his receipt and we were walked onto a gorgeous beach to our cabana for the day. It was complete with a table, four chairs, four loungers all under a hard roofed cabana with a bamboo wall at the back and two side curtains. We could sit in the sun or shade, order refreshments and food from a very attentive staff and walk 30 yards across white, white sand to swim in the clearest, most beautiful water. We read, talked, laughed, ate, drank, sent/received emails on complimentary wifi and just had the best time. A short van ride brought us back to the ship by 3:00pm and our six hour visit to Grand Cayman was over but not forgotten. A highlight of today was a talk put on by a passenger known as Dr. Dave, on whales. This man has spent a lot of time learning about whales and joining an exclusive Eco tour that allows small groups to learn about and snorkel with whales in an area 100 miles north of Dominica Republic where whales gather for calving and nursing their young before the 3500 mile track back to the cold North Atlantic waters to feed. Dr Dave presented wonderful video and still photos of humpback whales and told many stories and facts about these magnificent animals. Reflecting back on the past ten days and our first experience with Celebrity Cruise Lines, we found the experience to be first rate. -the on board entertainment was also, far and away the best we've ever experienced. You truly felt you'd be missing out on something great if you didn't attend. -they have children's programs aboard Equinox and the kids we met seemed to be having a good time. But clearly, children are not the main emphasis for Celebrity. 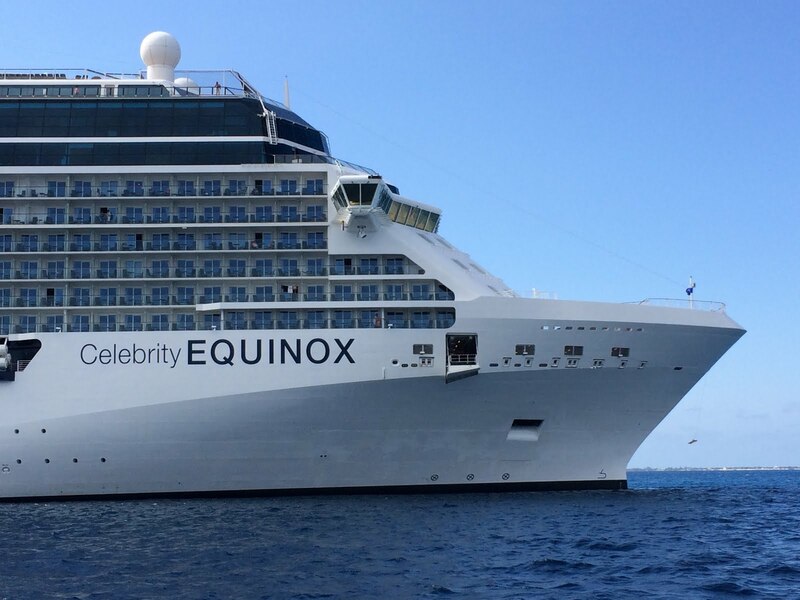 We can highly recommend Celebrity and I am sure when we next feel like going on a cruise, Celebrity will be our first choice. 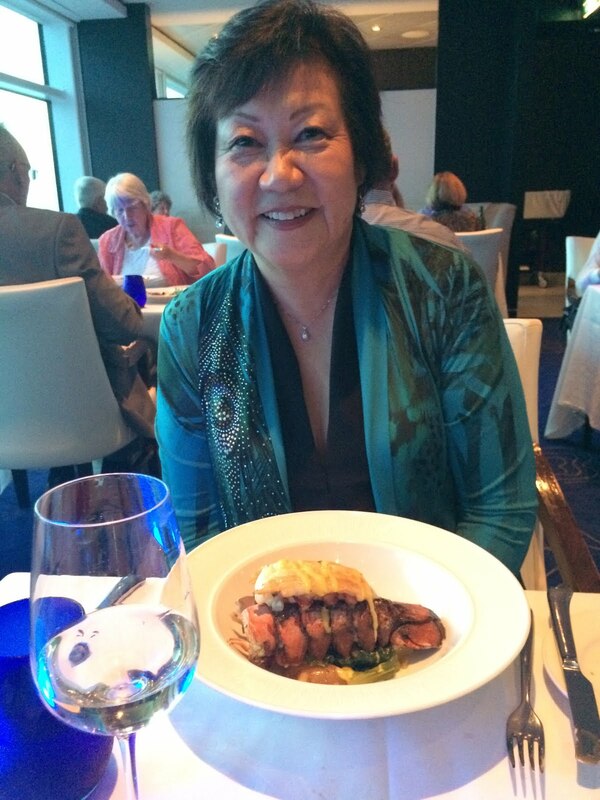 How's this lobster tail for "quality food"! !